A cat headdress pays tribute to Chaak Balam, the "Grand Jaguar" of the ancient Maya pantheon and a symbol of power. By Oscar Rodolfo Mendoza, this dramatic mask depicts an ancient Maya of noble standing, perhaps a priest or king. Modern artisans utilize the same materials and techniques as in pre-Hispanic times, achieving the red, yellow and orange colors from annatto seeds. 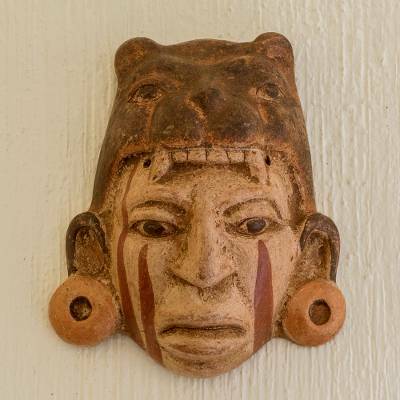 You can find ceramic mask 'Maya Jaguar Priest' by Oscar Rodolfo Mendoza in masks categories such as Animal Themed Masks, Archaeological Masks, Maya Masks and Ceramic Masks. Enjoy exploring these sections for other Novica treasures. Oscar Rodolfo Mendoza has received a $100 microcredit loan with 0% interest. Great mask! Fast shipping also! "We don't only craft objects that are pretty. They are linked to the history of our country and the ancient Maya culture, one of the most important in the history of humanity." "I was born in San Salvador in 1964, and grew up in a neighborhood in the south of the city, near the zoo. My childhood was happy – it was a simpler life. We'd play soccer in the street, and my friends and I liked to take bus rides just to see where it would go. I went to a Catholic school where, along with my parents' guidance, I was taught the moral principles that rule my life. My family was a close one and, from the time I was a young boy, I saw how my father and mother worked together to make a success of the business they started. This inspired me to follow their footsteps. "My father, Rodolfo Mendoza, is an economist. His first jobs had to do with organizations that lent support to small businesses. In 1975, he joined a group of artisans to set up a formal place where they could sell their work. At first, sales weren't good – El Salvador began having the political problems that led to war in the 1980s. So the founding artisans left the group, leaving it in my father's hands. He was able to make a go of it, thanks to a second job that let him pay the two workers out of his own pocket when there wasn't enough income to cover their salaries. "When I began studying business administration in 1984, my father said it would be a good if I'd work for him and that way, I could pay for my schooling. I began in the warehouse and as a salesperson – I did a little bit of everything. Eventually, I had enough experience to direct the workshop and I became the administrator. In 1992, we acquired a ceramic workshop to produce our own designs and in 1995, together with my wife and brothers, I launched a workshop of our own. "I love my country and our handicrafts are a reflection of our El Salvador. I'm strongly attracted to the Maya culture, which is why pre-Hispanic ceramics have always been one of my favorite art forms. And it would be a shame if this tradition were lost. That's why, in our workshop, we teach new artists and train them so that they can be a part of our team. I like to share what I've learned. Time is the best teacher. Over the years, as I've interacted with people, I've acquired the experience that has permitted me to develop our workshop and teach this beautiful art to others. "My dream is for this project to grow and to offer work to three times as many artisans. I'd like to create quality jobs that assure progress for the artisans. I dream about forging a strong and united artisan sector in El Salvador that offers its work to local shoppers who are proud of our work, and to foreign shoppers who recognize and prize our work for its quality and cultural value. "We don't only craft objects that are pretty. They are linked to the history of our country and the ancient Maya culture, one of the most important in the history of humanity. In this way we show that despite the centuries, ours is a culture that is still alive, thanks to the modern Maya living in our country as well as to the handicrafts that reflect their art, beliefs and traditions. "It's a wonderful opportunity to work with Novica. We want you to see the positive side of El Salvador, a beautiful country with a big heart."